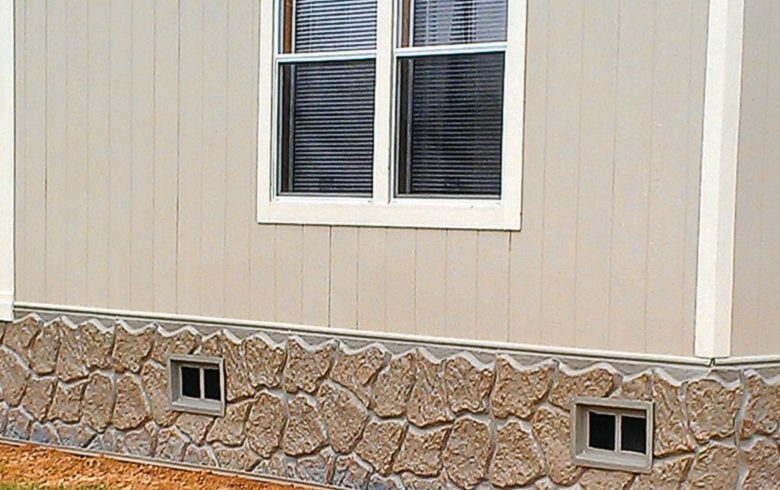 Mobile home skirting is a widely discussed part of a manufactured home. Nearly everyone can agree that it is a necessity either for the functional protections it provides or the visually finished look it can provide, or both! You may find skirting for a mobile home referred to as underpinning, manufactured home skirting, trailer skirting, trailer underpinning or other nicknames. Regardless of what you call it, in most parts of the United States, skirting is legally required. It is important to note that the terms mobile home skirting and manufactured home skirting are used interchangeably and refer to the same concept and accompanying products. From a contractors perspective, mobile home skirting is simply a non-structural enclosure of a foundational crawl space. It can be made from all sorts of materials such as metal, vinyl, wood, stucco, foam, plastic, brick and other man-made creations. Traditionally, mobile home skirting is attached to the side of a manufactured home at the bottom and extends to the surface of the ground. Put simply, skirting for a mobile home covers the open space between the ground and your mobile home, which can be 3 feet or more of open space. Skirting is the material which covers this area making a more finished look but it also adds some very helpful attributes to protect your home. Adds a protective barrier to keep out snow, rain, pests, and even people! Serves as a great place for dry storage for the garden, lawn care, and holiday décor items as well as anything you don’t mind getting a little dusty with temperature fluctuations. This is one of the most common questions we get. “Should we repair our existing mobile home skirting or should we just replace it?” As you can imagine, this is not very easy to answer without a thorough inspection of your mobile home skirting and an understanding of the size and layout of your home. Repairing your skirting is often a great choice if the affected area is relatively small or in an area that is not often seen. Depending on the material and look of your mobile home, a repair might be followed up with a coat of paint so that it all matches and is re-sealed from the elements. Choosing to repair vs replace your mobile home skirting is a function of time, material costs, and labor. At a certain point, it may become more cost-effective to simply have your entire skirting installation replaced. Ultimately, that is a calculation (and decision) that will be left up to you. The decision to replace your mobile home skirting comes with the luxury of choosing from the seemingly limitless number of options available today. Newer skirting also provides additional insulation benefits as well as longer lasting materials. If you have the budget, replacing your skirting can be a great improvement to the energy efficiency of your home as well as the overall visual appearance. Material costs for simple vinyl mobile home skirting start around $500 for a standard single-wide home, while more premium skirting such as stone can be had for approximately $3500 for a single wide home. How Much Mobile Home Skirting Material My Home Require? For many, walking into a store and walking out with the right amount of material is a shot in the dark. No one wants to buy too much or too little and end up making multiple trips to the store. The best way to go about this is to have the dimensions ready to provide to the staff of the store you choose or the website you buy from. 1. 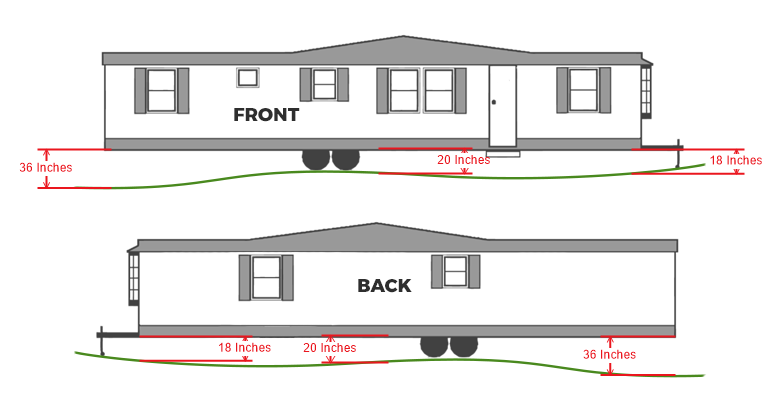 Measure the number of linear feet on the exterior of your manufactured home. This measurement is easy, simply add up all dimensions of each side of your home in which you intend to install skirting. Be sure to include all parts of your home that will have skirting including porches and decks. For example, if the exterior dimensions of your home are 18 feet wide by 90 feet long, then you would have (18ft + 18ft + 90ft + 90ft) 216 linear feet of material needed. In this example, the lot is uneven. We measure the corners on the front and back (adding 2 inches to each actual measurement from the ground to the bottom of the home.) The front corners are 36 Inches and 18 Inches. The back corners are 18 Inches and 36 Inches. Because the lot is unlevel we take an additional measurement in the middle of the long side, in this case, 20 inches. So if we add all of these 6 measurements together, 36+18+18+36+20+20 = 148. Then, we divide the total by the number of measurements, 148 / 6 = 24.66. 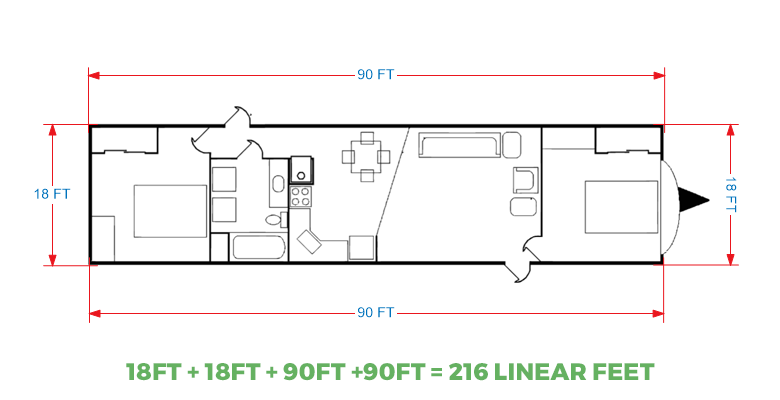 This is our average mobile home height. Round up for safe measure and call it 25 inches. Having the total linear feet needed and the average height of your mobile home will now allow you to consider the costs seriously for repairing and/or replacing mobile home skirting. Each store or website you visit will either use this information to provide you a quote or have tools available where you can enter this information to determine the amount of material you will require. You will not find a shortage of options to consider when it comes to skirting for a mobile home. Each comes with its own advantages, disadvantages, costs, and maintenance. It is important to consider each option carefully so that you find a good fit for your home. Vinyl Skirting Panel – Each panel covers several linear feet in most kits. They are easy to cut to fit for uneven lots. Ground Channel Track – This U-shaped piece will hold the bottom of the skirting in place and is secured to the ground with rods. Top Channel Back – This J-shaped piece is secured to the bottom of your mobile home and will hold the top part of the vinyl skirting. Top Front Finished Piece – This strip of vinyl secures over the top edge of the skirting to give a nice clean look once installed. Vinyl does have a few disadvantages. It generally does not hold up well in storms and high winds. It also tends to take a beating from weed trimmers and from any impacts really. Due to its affordability and durability, metal mobile home skirting has been the second most popular option for homeowners. Metal skirting is also easily painted which make future maintenance and repairs easier. There are many patterns that can be found with metal skirting aside from the corrugated barn look. Metal skirting is similar in cost to vinyl due to the relatively minimal amount of material and hardware needed for installation. For specialty designs and colors, you can expect to pay a 20-40% premium. In terms of new developments in mobile home skirting, this facet of the industry has seen the most advances. 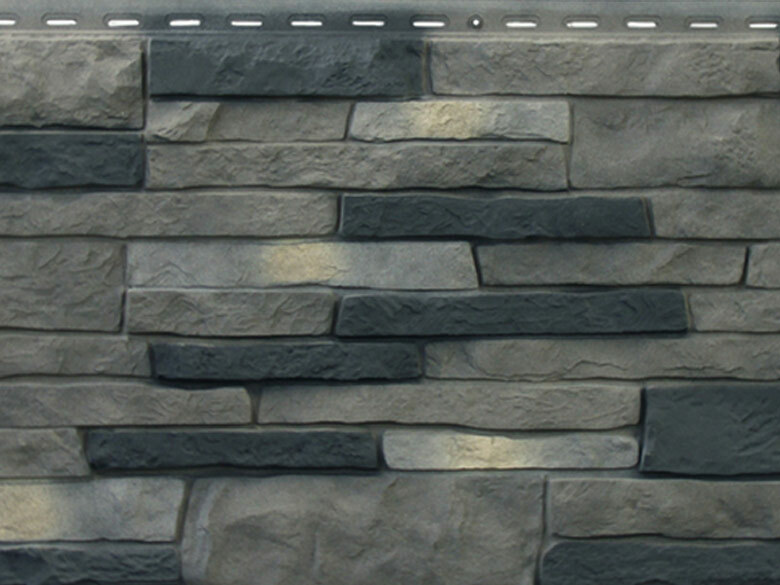 Several manufacturers have devised manufacturing processes that give the look of real brick, stone, etc. 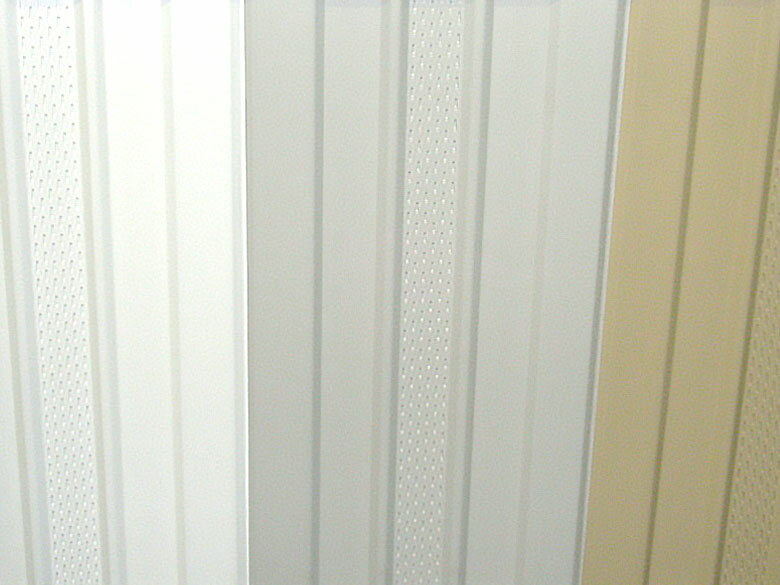 to panels made from various hardy plastic materials. In some cases, the panels are indistinguishable from the real thing until you get within a few feet. 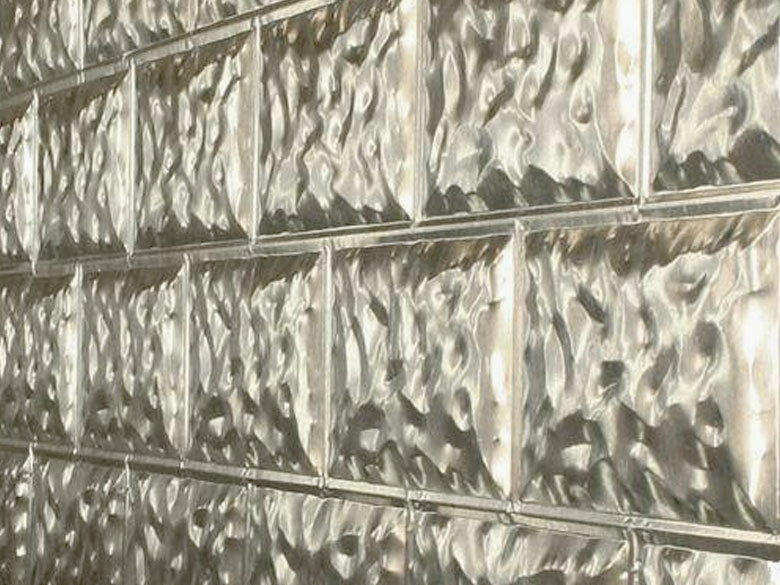 These panels generally hold up better to wind and storms due to their extra rigidity. They also will likely last longer and put up a good fight with lawn care beatings. Some also insulate much better depending on the manufacturer. These panels are usually heavily engineered and install easily. All this improvement comes at a cost as you can imagine. You can expect to pay 2-10 times the price of vinyl for these upgraded skirting materials vs vinyl. Ultimately, still a less costly option than the real counterparts of stone and brick.